I really don’t play that often in Orange County these days. 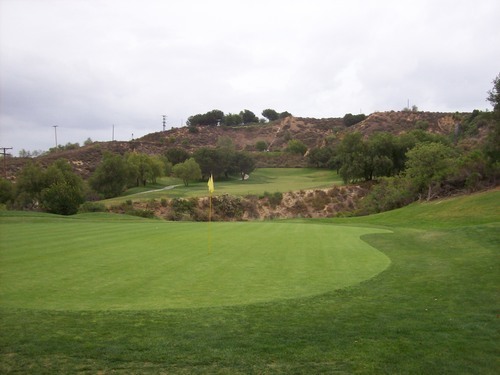 But after playing at River View in Santa Ana last Monday and then playing Coyote Hills in Fullerton on Sunday, that marks two OC rounds in one week! Definitely a rarity for the Golf Nomad, but it was nice to stay close to home for once. 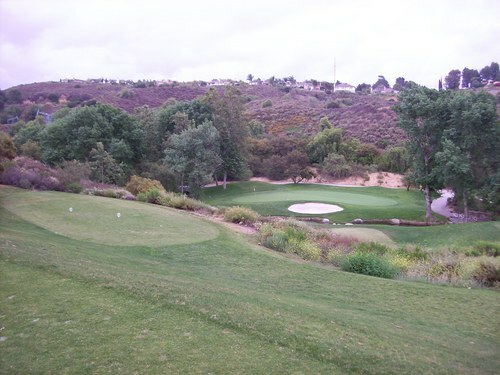 I played at Coyote Hills with the LA Golf Group I belong to, and we had plenty of fun as always. This is an especially “fun” course if you ask me, and we also played a unique format the organizers cooked up. They called it the “Red, White and Blue” tournament. 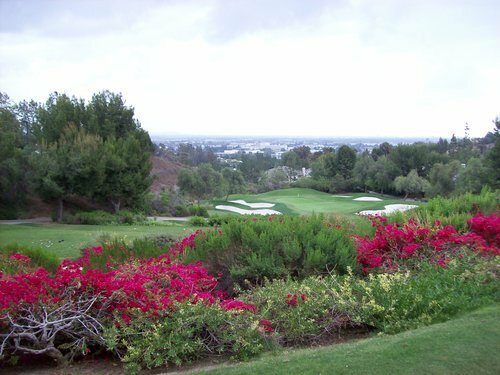 Originally, we were going to play at Industry Hills, which would have been nice, but the prices were a bit high and the people there weren’t very accommodating to our group event. So we switched over to Coyote Hills and it turned out to be a good alternative. “Red, White and Blue” refers to the standard forward, middle and championship tee markers on most courses. The idea is to alternate between the three during the round. 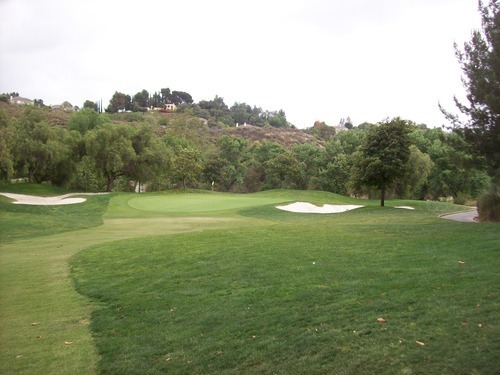 On the first hole, you play from the red tee. On the second, you play from the whites. On the third, you play from the blues. Then you rotate through the three tee boxes the rest of the way. Unfortunately at Coyote Hills, they actually have five sets of tees and different colors. From forward to back, they are green, white, blue, black and gold. So we decided to play the forward green tees, the middle blue tees and the gold (the “tips”). 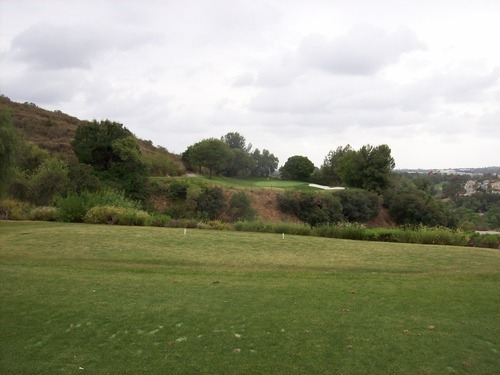 Though this course is relatively short, there was still quite a difference between the tee boxes. Some of the green holes were very short and some of the gold holes were quite tough. To quote Goldilocks, the blues seemed to feel “just right” and I was generally most comfortable on those holes. It was a fun format, though, and added some unique challenges to an already challenging layout. 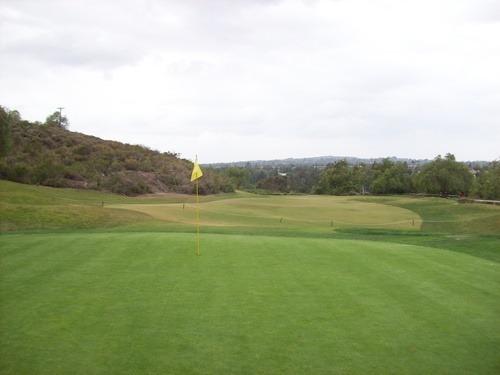 Coyote Hills is “target” golf to the max with a lot of tight fairways, hilly terrain, plenty of hazard areas and uncomfortable angles. It’s not a course where you can just bomb your driver, so strategy comes into play on many holes and safe shots are generally preferred over long hits. This was only my second time here. 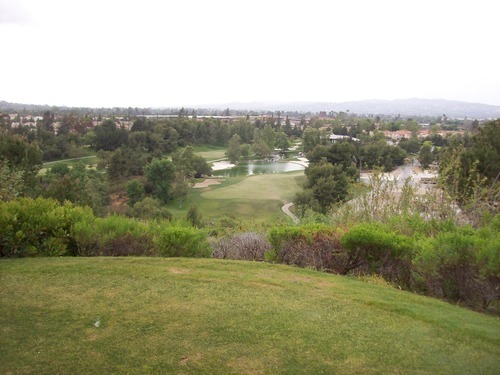 I really liked the course the first time around (maybe 6-7 years ago), so I was looking forward to coming back. 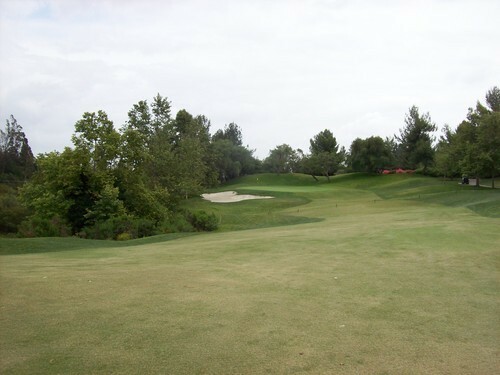 I personally enjoy tighter and hillier courses, so it fits my eye and a shorter target style of golf tends to fit my game better. 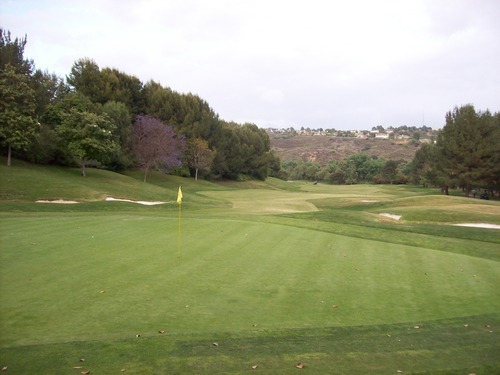 There are very few flat lies on the course and every hole presents its own set of challenges and options from tee to green. Some holes are dramatically uphill. Several are downhill. Some require lay-ups and others let you be more aggressive. 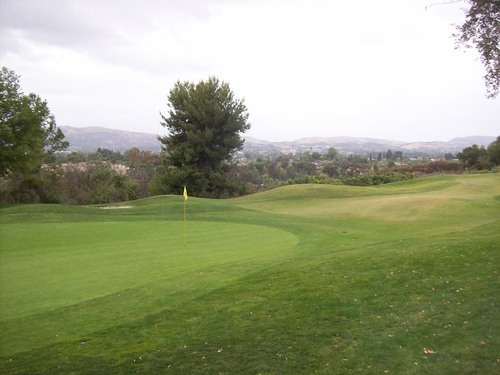 It’s a course that keeps your attention from holes 1 through 18. What’s interesting about Coyote Hills is how the course is laid out. 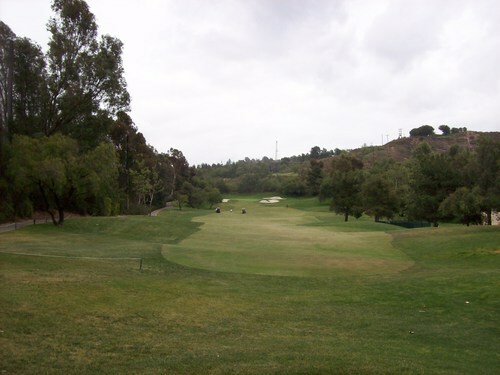 It really uses the hilly topography well and has a pretty secluded feel despite being surrounded by busy streets and houses that run along the outer edges of many holes. 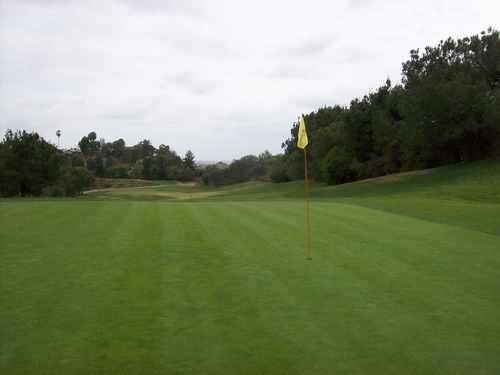 However, the houses are far enough away on most holes that they won’t come into play too often and it doesn’t ever feel like a “residential” golf course. 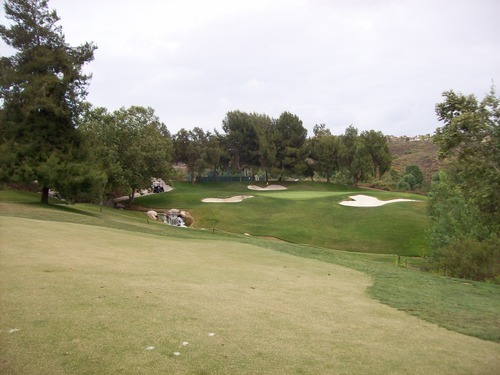 The course was designed by architect Cal Olsen along with PGA Tour legend, Payne Stewart. I was always a big fan of Payne before his untimely death and I don’t know of any other courses he had a part in designing. There is a statue of him outside the clubhouse and pictures of him inside the pro shop, so they take pride in the course’s connection to Stewart by honoring his memory. When they designed this course, they definitely faced some challenges. The property isn’t huge, but the holes all feel separated well. The land is actually a certified Audubon sanctuary, so they also had to work around environmentally sensitive areas. Those areas work to provide natural borders between holes and create the overall secluded feel. Lastly, the land is rich with oil. There are big pumps (derricks, whatever you call those things) throughout the property that they had to design around. They really don’t get in the way much, but are kind of an unusual aesthetic feature to have around the course. 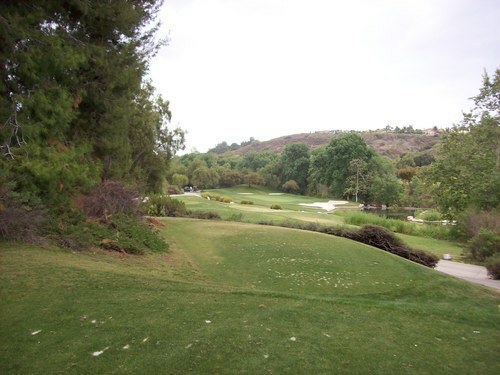 There are little creeks that run through the course and come into play on most holes on the back nine. 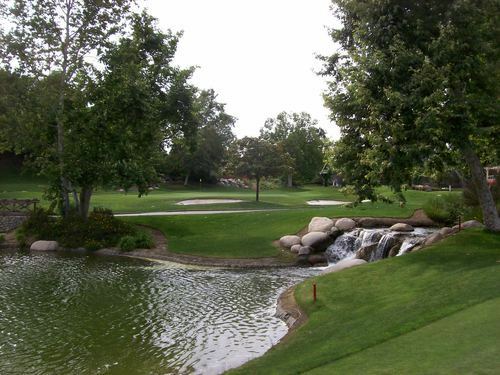 There are a few bigger water hazards, with the most prominent being the large pond that sits between holes 9 and 18 and makes those two very tough finishing holes for each nine. There are some significant elevation changes. Most notably are the par-3 3rd hole which offers a great view south and the crazy par-4 7th, which offers a spectacular view west and north. It was quite overcast Sunday, so the views weren’t as nice as on a clear day, but still pretty cool. The conditions were pretty good. 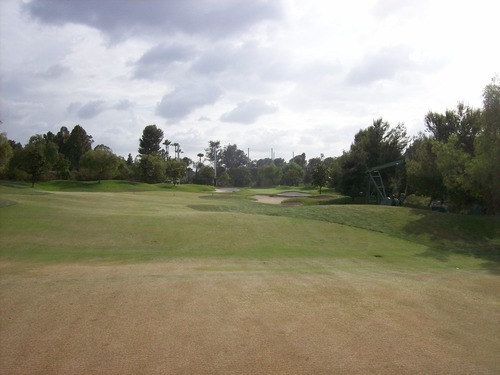 The fairways were pretty thin, which provided a lot of extra roll-out and tight lies on your approach shots. 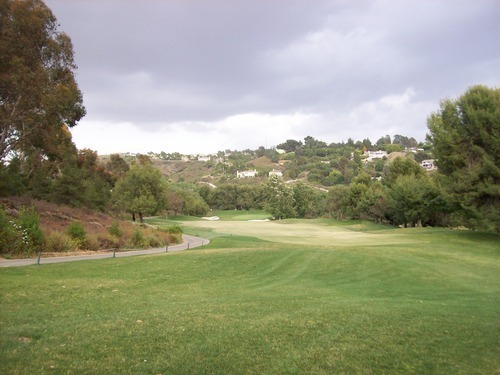 Sometimes the speed of the fairways was a good thing and other times it would roll you right into trouble because of some severe slopes. The rough was decent and the bunkers were full of good sand. The greens had recently been aerated. They do one half at a time here, so they were split vertically. Both sides were very soft and receptive, which was a nice change of pace after a few recent rounds on super firm greens. Naturally, the punched and sanded halves were a little slower on putts, but they weren’t bad at all to putt on. Most putts rolled pretty true. The un-aerated halves were a little quicker, but not super fast. 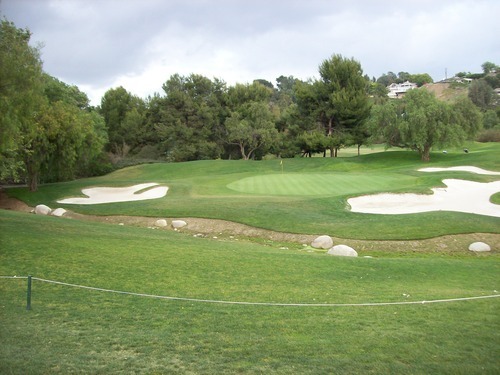 I enjoyed the course a lot this second time around and would still consider it one of my favorite layouts in Orange County. Not everybody will like the tight, unforgiving design and I understand that. To each his own! We paid $55 for a twilight rate. This course used to be way overpriced in my opinion, but it seems their rates have been coming down and that makes it a more appealing option. 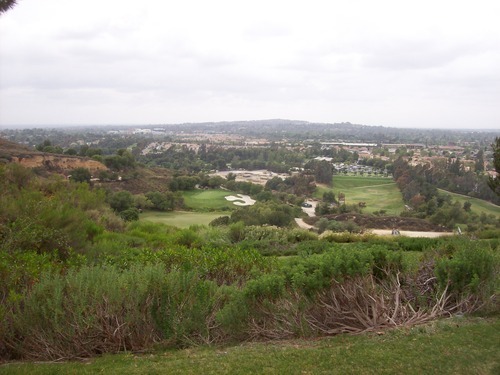 Still, it’s Orange County, so it’s not super cheap and you can generally expect a slower pace of play. Our round was about five hours. Last but not least, we found this little guy on one of the tee boxes. 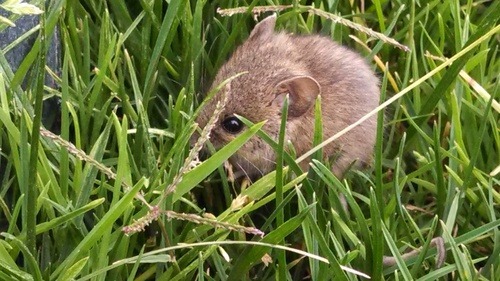 Just a baby mouse, but one of the smallest and cutest critters I’ve ever seen. Note: I returned here a year later and posted an updated review and some more pictures on a sunnier day. You can check that review out here.